After a few hard, diligent weeks the resolution to live better, eat healthy and be more active can become wearisome. The smaller portions, the intense workout and the lack of chocolate can make even the most resolute person start to waiver. Instead of going off the wagon completely, there is a solution to keep your resolution yet not feel deprived. Check out the 5:2 And Training by Niclas Brunnegard. The book, 5:2 and Training, relies on a simple concept. For two days a week, you stringently diet. This scenario means strict caloric intake or fasting. For the remaining days of the week, your diet is normal, ie not over-indulging, but a normal caloric intake. Niclas developed a 5:2 workout to increase the benefits of 5:2, as well as thoroughly tested and developed meal plans to get you through your 2 calorie-restricted days so you feel great! If you’ve heard about 5:2 diet and have wanted to try it or if you haven’t heard about it and want to learn about the life-altering health benefits like lowering your risk or resistance to: stroke, heart disease, blood sugar, insulin levels, blood fats (lipids) Diabetes Type 2, Parkinson’s, cancer formations, Alzheimer’s, Insulin sensitivity, and kidney disease, then you need to read this book. Links to scientifically researched studies show how these benefits through 5:2 can happen for you. What I like about this book is that the user doesn't get fatigued from constant deprivation. Anyone who has dieted knows that extreme caloric restrictions can lead to cheating. The impact cheating can have on the diet plan is worrisome. With the 5:2 plan, the food restrictions are limited, which makes them easier to follow. When the diet program is couple with physical activity, the user can see results. The combination of smart eating choices and an active lifestyle can make people feel and look better. The benefits of this program aren't measured in the inches lost, rather they are measured in the additional energy, better health and overall improvement in being. 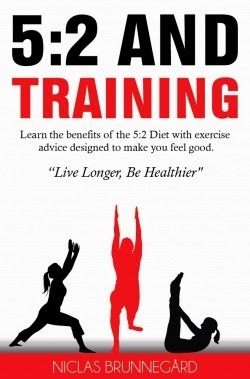 Would you like to read the 5:2 and Training book? Please use the Rafflecopter to enter. Disclosure I received one or more of the products mentioned above for free using Tomoson.com. Regardless, I only recommend products or services I use personally and believe will be good for my readers.